One of the ways that we are gifts to one another is when we team up to do something that we could not do alone. Sometimes we directly serve one another as I wrote about in the post about mutuality, but many times we serve alongside one another to accomplish a larger purpose. Our collaborative “work” may be in the home, at church, in a volunteer organization, or for paid employment. Wherever we are, when we work together, we are not only gifts to one another but we are gifts to the people and organizations we serve. In this continuation of my series on Receiving Others as Gifts, I am suggesting four conditions that facilitate working together: empowerment, trust, accountability, and communication. In what follows, I’ll say more about each one. Working together is at its best when each person is empowered to operate in his or her unique strengths. Part of the joy of working in teams is that different people can specialize in different facets of the work as each is gifted. Okay, of course, most jobs require us to operate in some or our less-strong areas to get the job done. For example, I don’t love making phone calls, but sometimes I have to. Still, when individuals can, for the most part specialize, everyone is genuinely engaged and invested because each gets to do what each loves doing. This benefits the project, organization or cause because it maximizes the time, energy, and expertise of the people involved. Working relationships require a basic level of trust. It’s best to assume people are trustworthy in their roles and tasks unless they prove you otherwise. When trust is present, we can each move forward in our unique roles trusting that others will do the same. Greater levels of trust can be earned when people fulfill their roles well and demonstrate faithfulness and commitment to the project or organization. Over time, as more trust is earned, the working relationship can strengthen. When we trust others, it means not worrying whether they’ll do what they said. It also means not micromanaging what they do. These behaviors ultimately only weaken the organization and erode trust over time. An empowered and high trust work environment also needs high accountability. Remaining open to questions and receiving feedback graciously helps keep the work on track. Of course, arbitrary and negative criticism is destructive and not what true accountability is about. Accountability, rather, can be thought of as check-points to support one another. True accountability reaffirms the goals and values of the work at hand in a positive way. It then helps people reflect on how they are doing with their parts in the work. Last, but not least, strong communication is essential for collaboration to be at its fullest. Keeping one another up-to-date about challenges and changes ensures that everyone is tackling the right job at the right time and with the right information. When problems do arise, clearly and graciously naming the problem and talking together about solutions is the best policy. Pretending a problem isn’t there and not discussing is hurtful to the organization. It is important to communicate affirmation in a working relationship as well as communicate about difficulties. Offering sincere and specific encouragement to one another contributes to a positive atmosphere in the organization. Through empowering others to use their unique strengths, trusting one another to follow through, remaining accountable to each other and communicating openly, we can establish a strong working situation. We can then receive one another as gifts as we collaborate, working together with joy. For as long as I can remember I have had some understanding that different people are, well, different. We don’t all like the same things, we don’t all behave the same ways, and we don’t all have the same ideas. Different people have different gifts and strengths and these should be honored and celebrated, not seen as a threat. When I was a kid in school I remember being really jealous when certain select individuals were considered “gifted” and got to go to special “enrichment” classes while the rest of us did our usual routine. I wasn’t the most enthused about school work and admit to often just doing the minimum needed to get by—as smart as I thought I was, I wasn’t exactly “enrichment” material. As I progressed through elementary school, other kids distinguished themselves in athletic achievements. I, on the other hand was challenged to meet grade level minimum standards on the annual physical fitness achievement test. Seeing other students excel in ways that teachers recognized and for which awards were given in school often led me to wonder whether I had anything distinguishing or remarkable about myself. Now, looking back on that time I can see trends of the types of things that I really put myself into whole-heartedly and truly enjoyed. These were creative pursuits of all kinds, a little entrepreneurship, and church-life. And now I’m putting all that together in my writing and speaking ministry! Whether we get recognition or awards or not, we each have unique gifts. The traits and experiences that set each of us apart make it so that, like snowflakes, no two people are exactly alike. And that’s a good thing! But sometimes we see our differences as a threat. And this is not altogether unfounded as there are indeed risks inherent in accepting the uniqueness of others. Sometimes we feel threatened by the success of another, like I did when other kids went to enrichment classes or got physical fitness awards. Sometimes to minimize this risk we try to be something we’re not. We can get ourselves awfully stuck by measuring ourselves against the strengths of others. It’s difficult to fully embrace the giftedness of others without also understanding our own giftedness. To that end, there are numerous professional assessments—the Myers-Briggs Type Indicator and the Strong Interest Inventory to name a couple. I encourage all people to spend some time learning what makes them unique. A book that offers a comprehensive overview is LifeKeys and I highly recommend it. But sometimes the differences of another feel threatening because we cannot predict or control what they will do. To minimize this risk we often try to reduce others down to how they are supposedly “just like us.” We think we can tame the threat they pose by finding what we have in common with them. Patrick R. Keifert, in his book, Welcoming the Stranger, warns against this leveling of the other. He advocates an understanding of the “irreducible other” arguing that to truly value others we have to let their otherness be what it is. It is important to be open to the strange and surprising aspects of others. Rather than minimizing differences we do well to embrace them. The differences among us do not have to be threatening. Gaining clarity about our own strengths helps us feel more secure and less apt to measure ourselves by an impossible standard. And acknowledging that others are never going to be quite like us or within our control can free us up to the ways that they will surprise us. As we navigate these risks we can then more fully embrace the giftedness of others. Disclaimer: Links in this post will take you to the Amazon store at Life & Liberty Online Magazine where I am on staff as Editor-in-Chief. A portion of your purchase there will benefit our work at Life & Liberty. This is the first post in my new series about “Receiving Others as Gifts.” For background to this series, please read the introduction from last week: Introducing a New Series on Receiving Others as Gifts. To see all of my blog posts related to this subject, check out the tag: Others as Gifts. I love the Kenneth Bailey video on footwashing that I posted back in November. I love everything about that video really. But most especially meaningful to me was how he made the case for how radical footwashing is and then how he lifted out the verse about how we ought to wash one anothers’ feet! Bailey talked about the power dynamics at play when service is rendered. The idea was that service as we are called to is often from a position of power–the one has something the other needs–the giver is the one with the power. Bailey rightly points out the danger of using service as a power play. The way to guard against the power dynamics getting out of hand , then, is to wash one anothers’ feet–for each one to take turns both giving service to and receiving service from one another. When it comes to receiving others as gifts, I think this idea of mutual giving & receiving is really important. The temptation to always be the one giving is great in our busy world. We don’t want someone else to be put out. And we certainly don’t want to feel like we owe someone for some service they’ve rendered! No, we’d rather be the ones doing the giving, doing the serving, doing that thing that puts someone else in our debt. Oh, of course, we don’t expect them to repay us–but that only heightens the sense of indebtedness that the one served may feel. The most profound act of service we can render is to receive service from another, to lay down our need to be large and in charge and to humble ourselves enough to allow another to be or do for us something that we cannot do or be on our own. Admitting that we can’t be all things to all people is often scary. To own our limitations and our neediness is not comfortable or automatic. It is a deliberate choice to drop our sense of superiority, to drop our self-centeredness, and to allow someone else to be greater or more central to us than we’d like. Another feature of that Bailey video mentioned above is he calls attention to the bond that is formed when service is given and received. The two parties are brought into closer relationship by the service given and received. We can choose to decline the service offered to us–I mean, we may not always need what is offered at exactly the time and place it is being offered. But to decline the service of others is to distance ourselves from those offering it. We may have our reasons to decline, but it is wise to be aware of the cost. If we continually deny others the opportunity to serve us we may find ourselves in total isolation. We may end up so far removed from others as to have no meaningful, sustaining community on which to rely when we eventually realize that we need it. Plus, if we allow ourselves to become isolated by refusing to be served, then we’ll have no one left who needs or relies on us! Our own best service will be useless if we have no one close enough to us to receive what we have to offer. I’m convinced that we need each other in this life. We need the gifts and service of others and they need ours too. This mutual giving and receiving is part of God’s original intent for us and Jesus affirms it. May we be blessed by and be a blessing to others through our serving one another. Read the rest of this essay at Life & Liberty to find out what I have to say about what Frozen can teach us about using our powers and abilities for good. Click the photo above to read the essay. 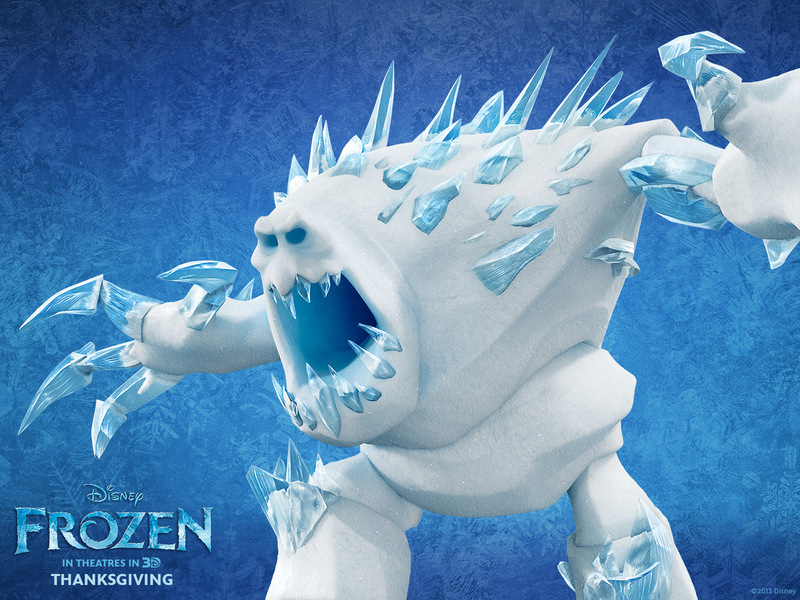 The parents in Frozen inadvertently fueled the monstrous side of their daughter’s powers. So, I’m pretty sure I’ve got a whole book in me about Disney’s Frozen because I like it so much and it really gets me thinking. I’m writing a pair of essays for Life & Liberty about what the movie can teach us about the use and misuse of power, but I wanted to insert this between those essays to expand on a problem I have with the parents in that movie. *SPOILER ALERT* This essay discusses major plot points of the movie including surprising twists to the story. If you have not seen the movie and do not want to know how the story unfolds, do not read this essay. As we get to know Queen Elsa, we see that she has a great struggle within herself that is grounded in fear. Her particular fear is that she will hurt someone with her powers just like when she accidentally struck her sister, Anna, with them in when they were children. In all fairness, the wacky troll that heals Anna and the girls’ parents feed right into Elsa’s fears. The troll erases Anna’s memories of Elsa’s magic and warns Elsa that fear will make her powers more dangerous. The parents then keep Elsa away from other people—including Anna—as much as possible. The more Elsa tries to conceal and control her powers, the more afraid she becomes and the more of a threat her powers present. So primal is her fear, that it manifests violently against others—including her beloved sister—in order to protect them from her. I mentioned the parents in passing, but the truth is that they played a significant negative role in their daughters’ lives by keeping them apart, isolating Elsa, and hiding the truth from Anna. I suppose it makes a more compelling story to have the girls grow up with this gulf between them. It makes it more dramatic when Anna–who has been shut out by Elsa for so long–stands between Elsa and the sword intended for her. Storytelling devices aside, it’s pretty terrible to lock a girl away just because of one mishap with her powers. As we see early on, Elsa’s powers can be used to create the most amazing, fun and beautiful playscapes. She and Anna enjoy the winter wonderland that she creates in the castle ballroom. The accident in which Anna gets struck by Elsa’s powers was because Anna was so absorbed in her enjoyment of her sister’s creations that she misjudged a jump from one snowy peak. It was only in trying to give Anna a safe landing place that Elsa accidentally struck her sister with her powers. There was no malicious intent in Elsa’s actions. She was not some monster, she was a young girl with an extraordinary gift that accidentally got out of control once. I understand that the parents were concerned for Anna’s safety. And they were concerned for the safety of their kingdom. I get that, I really do. But there had to have been a better way. There just had to have been. I’m not a perfect parent, but I do make a point to honor my kid for who he is. And I try to encourage his best gifts rather than squash his potential at the first sign of struggle. The obvious key to Elsa harnessing her powers for good was the emotional support she received from Anna and others at the end of the movie. What if the parents had been giving that kind of support all along? See, to me, that’s a big part of a parent’s job. As kids discover the range of their capabilities, parents are in a unique position to help their kids learn appropriate applications of their skills. Kids can live more fully into the positive & appropriate applications of their skills when parents come alongside them and allow them to practice using them. I recognize that practice can be messy. There will be risks, missed marks, and set-backs. These are hard, but the best skills are worth honing for the good they can bring to our world. But Elsa’s parents didn’t allow her to practice her powers. They decided for her that she shouldn’t because they assessed that the risks of her using them were too great. By imposing strict control on her and isolating her they seemed to think they could eliminate the risks associated with her powers. Risk-elimination, no matter how well-intentioned, is as destructive as it is naive. We can never eliminate all risks and to try to eliminate risks is only to introduce different risks. People are not meant to live isolated lives of fear. We are given gifts and skills to be used for the good of others. When people don’t get to use their gifts then they are at risk for shame, self-loathing, and depression because of the belief that their skills are bad. And when our abilities are not harnessed and guided for good, then the risks get exponentially greater when our abilities manifest in negative or destructive ways. And so, by trying to eliminate the risks of Elsa using her powers, the parents in Frozen made the situation worse. Elsa hated herself and her abilities and no matter how hard she tried to stop using her powers, they could not be contained. And not having practiced positive applications of her powers in a loving environment, she did not have the emotional resources to direct them for good. On top of that, their deception of Anna came with additional risks. Of course, there was the obvious risk of Anna losing her favorite playmate. But beyond that, and I want to tread carefully here because I would not want to crush the spirit of a dear soul like Anna, but the parents never dealt with the risky behavior of Anna that led up to the accident with Elsa’s powers. Anna was a free spirit and we love that about her. Nonetheless, learning to look before she leapt could have served her well in life. She loved and trusted easily which are admirable qualities, to be sure. But instead of helping her learn to manage the risks of her approach to life, the parents enabled her to remain oblivious to the dangers they posed. And the risks of Anna’s approach to life were great. Let us not forget that the man who tried to kill Elsa was the man with whom Anna had jumped into engagement after singing and dancing with him for just a few hours. It was not Anna’s fault that Hans was a bad guy, but she was responsible for putting in charge of the kingdom a man she barely knew. Of course, we know how the story ends and that Anna’s power of love saves the day. So, like I say, I wouldn’t want to squelch this power of Anna’s! But the parents could have been better resources for her as a child by allowing her to see the risks involved in loving and trusting so fully and so readily. As I say, I realize that the situation the parents created sets up a great story. And this is only fiction. But those parents just bug me.